Discussion in 'XJ4Ever - Supporting Vendor' started by chacal, Aug 25, 2010. Electrical problems can be terribly difficult to diagnose properly. And to add to your level of frustration, both electrical and fuel-related problems can manifest themselves in the same ways: hard starting, mis-firing, poor performance, back-firing, etc. Although the electrical systems on XJ bikes are fairly durable, there are a number of known, common problem areas on these bikes, which are compounded by the fact that these bikes are 25+ years old. The fusebox is the most critical area: the stock one may have been adequate in 1981, but it's now old, outdated, and ready for the dust-bin of history. We carry replacement ATC-style fuseboxes and in-line fuse holders which allow you to easily upgrade your original. 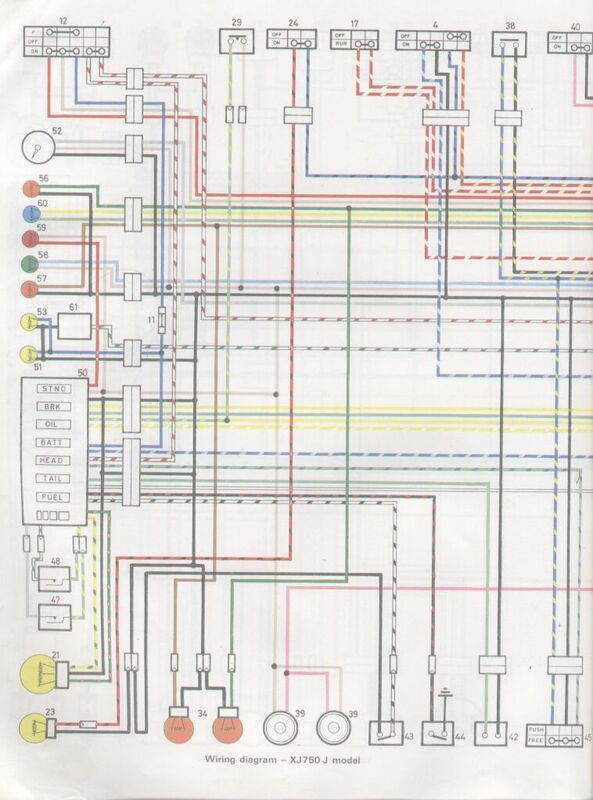 Anyway: finally, in a general electrical system sense, the wiring harness on your bike is getting old---and like most vehicle wiring harnesses from this era, they aren't (and never were) the most robust things ever made. Corrosion, weak connectors, and other assorted issues will cause you all sorts of headaches and the agony of electrical troubleshooting nightmares if not addressed and remedied. I highly recommend that you visit that site and PRINT OUT the FAQ (you never know when a web page might disappear from the web), as it is the "Electrical Bible" for XJ owners! And finally, if you want to become much more of an expert on your electrical system, we recommend this excellent site……although it was written by/for owners of the Yamaha Vision series of bikes, all of the basic information and some of the bike-specific information is also applicable to the XJ model bikes. Easy to understand, and easy to learn from, the ideas and concepts explained here can really help you become comfortable enough to perform many diagnostics and repairs to the electrical system on your bike. One of the most frustrating problems you can run into is a bike that refuses to crank over, or will crank over but won't ever fire. Assuming it's not an engine (fuel or mechanical condition) issue, then it may be caused by your electrical system; more specifically, by the rather unique system of inter-related devices that Yamaha collectively refers to as their "safety switch system". Consisting of assorted switches, relays and their wiring, you may have to do some heavy-duty electrical sleuthing in order to determine where the problem resides. Curiously, Yamaha used the same general style of "cube" relays in a variety of different positions for the safety system, and although they all look virtually identical to each other, they in fact all perform differently. But since they are all interchangeable......a headlight relay, for instance, will happily plug into the sidestand relay wiring harness connector shell....so the first troubleshooting step is to make sure that each relay is correct and in its correct position. For instance, the sidestand relay is a normally closed relay while the others relays are normally open. The head light relay and the ignition cut off relay (also called the neutral safety relay) both contain diodes, which means that they are controlling voltage coming from two different sources. Although they are both normally open and both contain diodes, they are still vastly different in their coil resistance ratings and are thus not interchangeable. Since an incorrectly positioned relay will typically not work, or will work "incorrectly" when placed at the wrong position in the harness, determining whether relays are properly positioned, and of the proper "type", can save you some more painful types of troubleshooting! If that doesn't do it, you have to start checking all of the other components......the actual switches or sensors, the diode block, etc. The actual electrical testing of each relay differs by relay, and sometimes by model bike, and for that type of information, we will refer you to your factory or aftermarket service manual for further guidance. Make sure you have a volt-ohmmeter and a 12V power source at your disposal to check these relays. 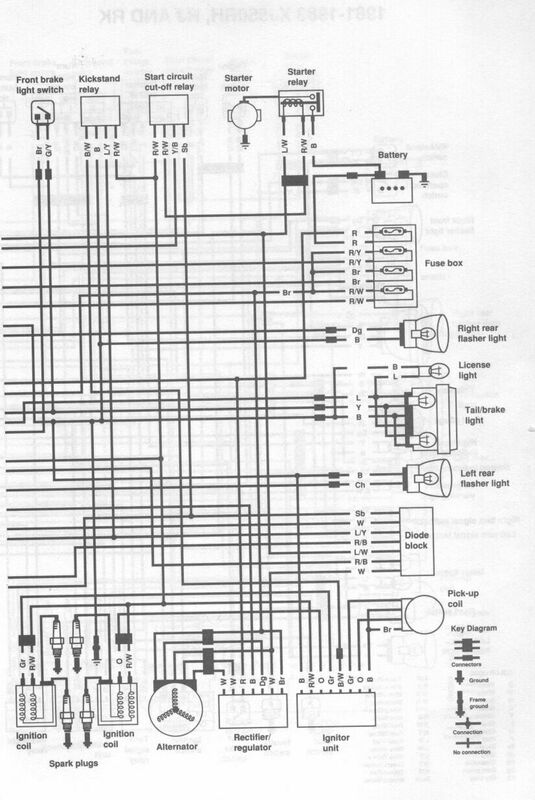 NOTE: many of the factory and aftermarket service manuals and the factory parts diagram sometimes mis-label a relay's function----for instance, calling a sidestand relay the headlight relay----or, mis-placing the relay in their diagrams----for example, showing the starter cut-off relay mounted in position "A" and the sidestand relay in positions "B", when in reality their real positions are exactly opposite! Also, please note that the factory and aftermarket manuals are not always very clear as to where a particular device is physically located on a specific model---in some cases, text such as "this relay is located "somewhere" on the bike"---would actually be more helpful than their generic shadow-bike drawings and "pointing-to-somewhere" arrows that passes for a location guide. And finally, to throw a little extra salt into those pesky electrical wounds, the factory and aftermarket manuals are sometimes not quite clear or correct in illustrating the relay testing procedures needed.......in particular, the Haynes manual is somewhat of a mess, as diagrams are mis-placed or hard-to-follow while they try to cram multiple testing procedures for a similar relay onto a single page or pages. Luckily, relays are hardy little devices, and rarely fail completely; more than likely, they are either mis-placed, or dirty (rusty) inside, and a gentle and graceful removal of the outer can will reveal their little electrical guts, which can them be cleaned with electrical contact cleaner, etc., and thus lovingly restored to their functional beauty. Likewise, don't assume that you have a good ground, always check (or jumper to ground) to make sure. Many component "problems" are actually due to a lack of power supply or the lack of a proper ground path! * continuity test: circuit should be complete when switch "plunger" is relaxed (plunger extended out, hand lever pulled to handlebars) and circuit should be incomplete when the plunger is pushed in (hand lever away from handlebars). 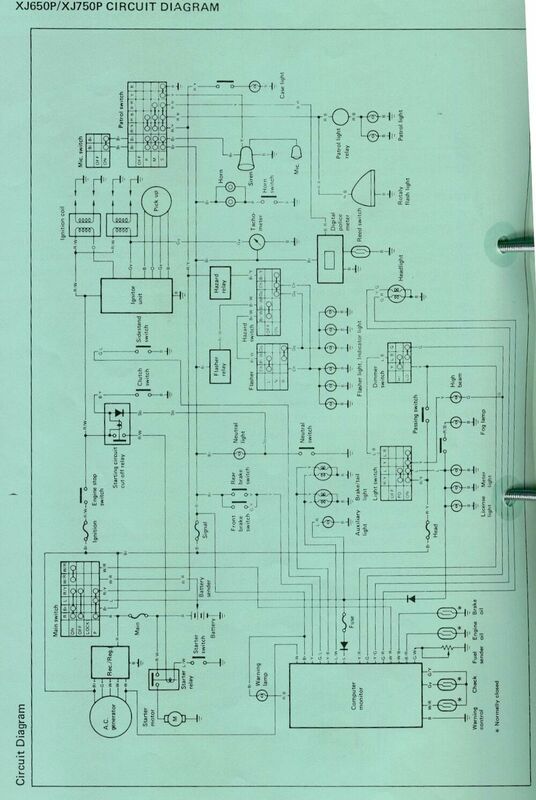 * continuity test: circuit should be complete when switch "plunger" is extended (out, brake foot pedal activated) and circuit should be incomplete when the plunger is relaxed (retracted in, brake foot pedal not in use). * continuity test: circuit should be complete when switch "plunger" is "closed" (transmission in neutral) and circuit should be incomplete when the plunger is open (plunger extended). 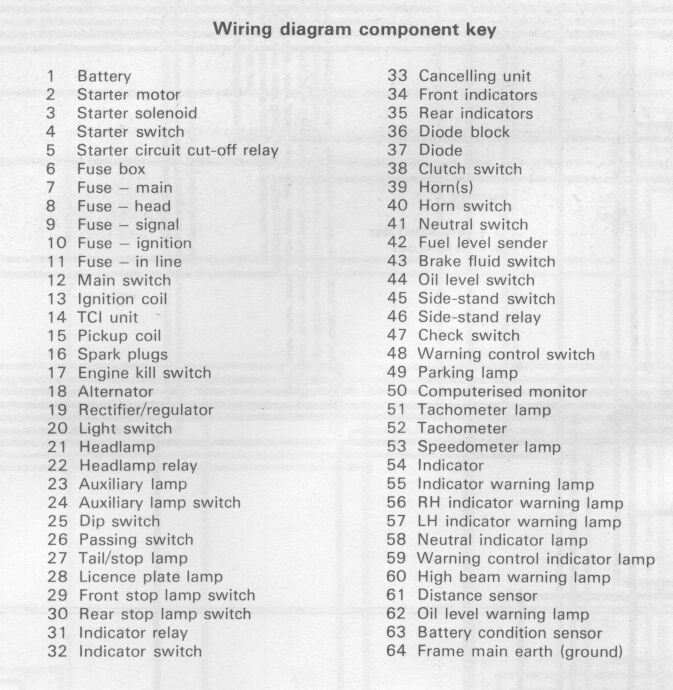 Note that the switch completes the ground circuit from the neutral indicator light to the internal shifter drum, and not to the neutral switch "housing" (on 650 thru 1100 models). * continuity test: circuit should be complete (0 ohms) when switch "plunger" is extended and circuit should be incomplete (infinite ohms) when the plunger is pushed in. - due to many variations in design and the need for visual reference, you should check your service manual for the proper testing procedures. There are at least two checks that are necessary to perform: a relay coil resistance check, and a relay coil function (powered vs. unpowered) check. - due to many variations in design and the need for visual reference, you should check your service manual for the proper testing procedures. Basically, a diode allows current to flow through a circuit in one direction only; therefore, when tested with a continuity meter, should show continuity when checked with the probes placed in one orientation, and then when the orientation of the probe leads are reversed, no continuity (no circuit). - due to variations in design and the need for visual reference, you should check your service manual for the proper testing procedures. There are at least three checks that are necessary to perform: a relay coil resistance check, and a relay coil function (powered vs. unpowered) check, and a diode function test. - due to the need for visual reference, you should check your service manual for the proper testing procedures. If the use of a screwdriver blade across the two large threaded stud terminals results in the starter motor operating, then the "solenoid" portion of the unit is operating properly, and it is the "relay" portion of the device that may be defective. * continuity test: circuit should be complete (0 ohms) when switch is positioned at a 60-degree rotation from vertical (in either direction) and circuit should be incomplete (infinite ohms) when the switch is positioned vertically. - due to the need for visual reference, you should check your service manual for the proper testing procedures. There are at least two checks that are necessary to perform: a relay coil resistance check, and a relay coil function (powered vs. unpowered) check. - due to the need for visual reference, you should check your service manual for the proper testing procedures. - due to many variations in design and the need for visual reference, you should check your service manual for the proper testing procedures. There are at least three checks that are necessary to perform: a relay coil resistance check, and a relay coil function (powered vs. unpowered) check, and a diode function test. - disconnect the White with blue tracer stripe wire at the headlight relay. - turn on the ignition - the headlight should be off. - momentarily jumper 12V to the pin on the relay where the white/blue wire was connected, and the headlight should come on and stay on. - due to the need for multiple tests, you should check your service manual for the proper testing procedures. How to bypass various relays: first of all, our advice is DON'T. The relays and switches are there for a reason....your safety, to prevent "mistakes" from turning into "disasters".......so our recommendation is to just leave the system as it is, and replace any components that fail. However, for failure testing purposes, it may be necessary to temporarily "by-pass" certain components, thus eliminating their functionality from the circuit, to see if they are the source of whatever problem is occurring. - twist the two (or three, depending on the model) wires together and ground them. Grounding the wires is the only way to complete the circuit that activates the sidestand switch relay. - unplug the safety relay which disables the whole bloody mess but DO NOT leave it that way, fix it right! - jumper the wires (on the main harness) to each other, the circuit will think the hand lever is pulled in. - jumper the lead wire to a known good ground; if the neutral light comes on (assuming the bulb is good! ), then the wire circuit is good. If the neutral light will still not light up when the transmission is in neutral, you can try jiggling the switch slightly (tap on it with a screwdriver blade, etc.....it's hard to reach) or tightening the switch slightly. Otherwise, the switch is either bad internally, or the brass plunger has worn down to the point where it cannot make contact with the shifter drum plunger (550 models) or the drum itself (650 thru 1100 models) and should be replaced. - bypass the relay by connecting the Blue wire with the black tracer stripe directly to the Red wire with the yellow tracer stripe. - use a screwdriver blade to cross the two large threaded stud terminals. If this procedure results in the starter motor operating, then the "solenoid" portion of the unit is operating properly, and it is the "relay" portion of the device that may be defective. - the water-cooled XJ700 and XJ750-X engines use a an electrical thermo unit and thermoswitch to sense and relay information to the temp gauge (how hot is my coolant?) and to the fan motor (turn me on or off). Both of these devices screw into the thermostat housing. 1) do not drop this sensor! If dropped/shocked, it should be replaced, regardless of testing to specifications or not!! Make sure your thermometer is accurate! Make sure your thermometer is accurate. - on all XJ550 models: under the gas tank, in-between the frame tubes, on a welded bracket just behind the flasher self-canceller relay. - on all XJ650 Maxim/Midnight Maxim/RJ Seca models: behind left side cover, below the TCI and Regulator-Rectifier unit. - on all 1981-83 XJ750 Seca models: behind the left side cover, below the TCI and Regulator-Rectifier unit. All other models do not use a headlight relay. - small metal "cube" relay, inked 3H5-00 on the top face. - has a yellow (yellow) paint mark on the bottom terminal connector block. - normally open; has an internal diode. NOTE: all XJ700 models and XJ750-X models use a consolidated relay assembly (mounted under and to the rear of the fuel tank, on the wishbone frame triple-tube joint) which combines the turn signal flasher, the turn signal canceller relay unit, and the starter circuit cut-off relay. - on all XJ650 )except Turbo) and all 1981-83 XJ750 models: on a tab bracket welded to the right side frame tube, towards the front of and under the gas tank (under the ignition coils). - on all XJ650 Turbo models: onto a welded bracket on the right side of the main headlight support fairing. 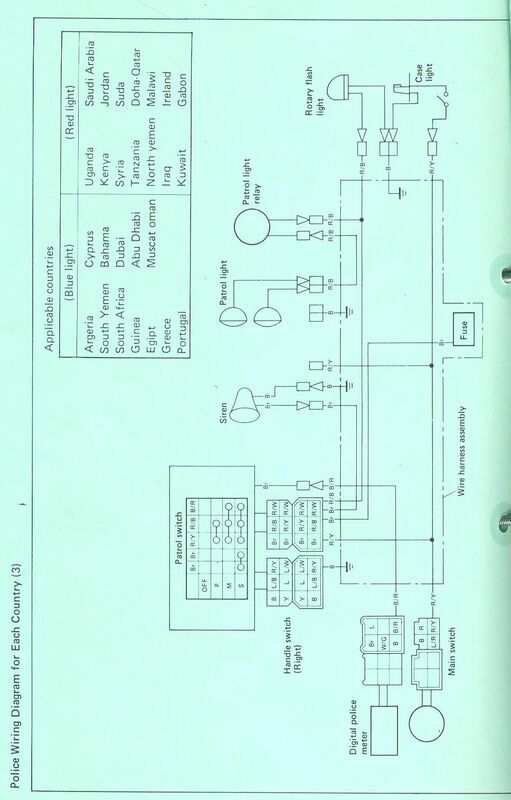 - on all XJ700 and XJ750-X models: part of the consolidated relay assembly listed further below. - on all XJ900 models: under the seat, in the "electrical tray". - on all XJ1100 models: on a tab bracket welded behind the right side frame cover, near the fusebox. - large rectangular plastic relay, inked "Nippondenso FU257CD and DOT 6944" or similar on the large face. * Black solid wire (for the "B" terminal on the relay). - on all XJ550, XJ650 (except Turbo), XJ750 non-X, and XJ1100 models: on a "skinny" tab bracket welded in-between the upper frame rails, to the rear of the ignition coils. - on all XJ650 Turbo models: on a "skinny" tab bracket welded to the right frame down tube, below the airbox. - on all models except XJ700 or XJ750-X models: a 3" long, 1-1/2" wide rectangular cube relay housed within a soft rubber "sleeve" with 5 wires coming into it from a white or black plastic connector shell on the end of the wires. 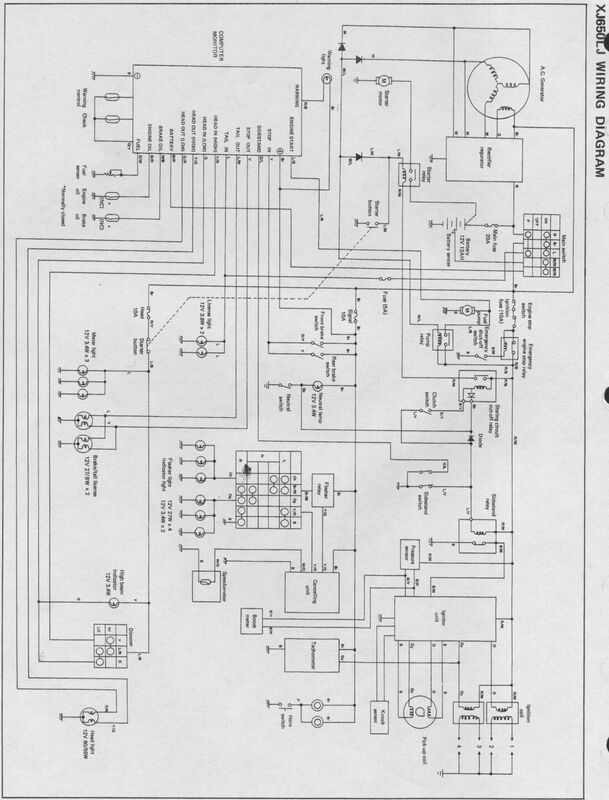 - on all XJ700 and XJ750-X models: part of the consolidated relay assembly listed below. This large device combines the flasher relay, the flasher canceller, and the ignition cut-off relay into one big "black box" unit and is no longer a small "cube" type relay as only other XJ models........and it is used only on the XJ700 and XJ750-X models. - mounted under and to the rear of the fuel tank, behind the wishbone frame triple-tube joint. - large rectangular black plastic relay, inked 41R-71 and then "ND FX257N"
- in the oil pan, secured by two hex-headed bolts. - a round cylinder with a single lead wire coming off the bottom of the sensor housing. The cylinder fits into a round hole in the bottom of the oil pan. * Black wire with a red tracer stripe. NOTE: factory wire diagrams show the main harness wire attaching directly to the sensor---this is not correct. The Black wire with the red tracer stripe is on the main harness, and it attaches (via a bullet connector) to a 40" long (varies by model) "extension wire" of the same color that then runs to the oil level sensor itself. This extension wire is bundled within the pick-up coils harness. The short wire lead coming off the sensor itself may be a variety of colors. - round black plastic cylinder with two lead wires (length varies by model) coming off of it. The switch body has two opposed latching "teeth" in it that allows the switch body to latch into the clutch lever perch housing bore hole . The operating end of the switch has a plunger rod. NOTE: to allow the removal of this switch from the housing, there is a small diameter access hole in the master cylinder housing. Sticking a small screwdriver tip (or similar) into the hole pushes back on the latching "tooth" of the switch body, thus allowing the switch body to be withdrawn from the master cylinder housing. NOTE: wire lead colors may vary on some models and on replacement switches. These wires terminate into a 2-position plastic connector shell that is located within the headlight bucket. - screwed into a welded-on tab bracket on the right frame down tube, generally located somewhere directly above the rear of the brake foot swivel arm. NOTE: on XJ650 Turbo models, this bracket and switch is located a fairly long distance away from the pedal itself, and there is a long wire extension rod that connects the brake pedal swivel arm to the switch plunger. - round black plastic cylinder with a threaded end. The operating end of the switch has a brass plunger, which attaches to a short extension rod and a tension spring. - varies by model. The switch itself typically has two solid black wires coming off of it, which plug into a solid yellow wire and solid brown wire on the main wiring harness. - round black plastic cylinder with two lead wires (length varies by model) coming off of it. The cylinder has two opposed latching "teeth" in it that allows the switch body to latch into the clutch lever perch housing bore hole . The operating end of the switch has a plunger rod. NOTE: to allow the removal of this switch from the housing, there is a small diameter access hole in the clutch perch housing. Sticking a small screwdriver tip (or similar) into the hole pushes back on the latching "tooth" of the switch body, thus allowing the switch body to be withdrawn from the housing. * Black wire with a yellow tracer stripe. NOTE: wire lead colors may vary on some models and on replacement switches. These wires terminate into a 2-position plastic connector shell that is located within the headlight bucket. The wire leads from this switch are interact with the starting/ignition circuit cut-off relay. * located inside the engine shifter case side cover. * in a recessed "well" in the bottom of the crankcase, just "outside" of the oil pan, on the bottom of the engine, on the left side of the bike. Can be very difficult to see or access while the exhaust is on the bike and/or when the engine is in the frame.........the left lower frame tube obscures the vision in this area. * a white "rounded triangle" shaped flat plastic piece, held in by 3 screws, and a single black wire coming off of it. * hex-headed "bolt" with a internally threaded head. A phillips-drive screw threads into the head and hold the ring terminal that is on the wire leading to this switch. 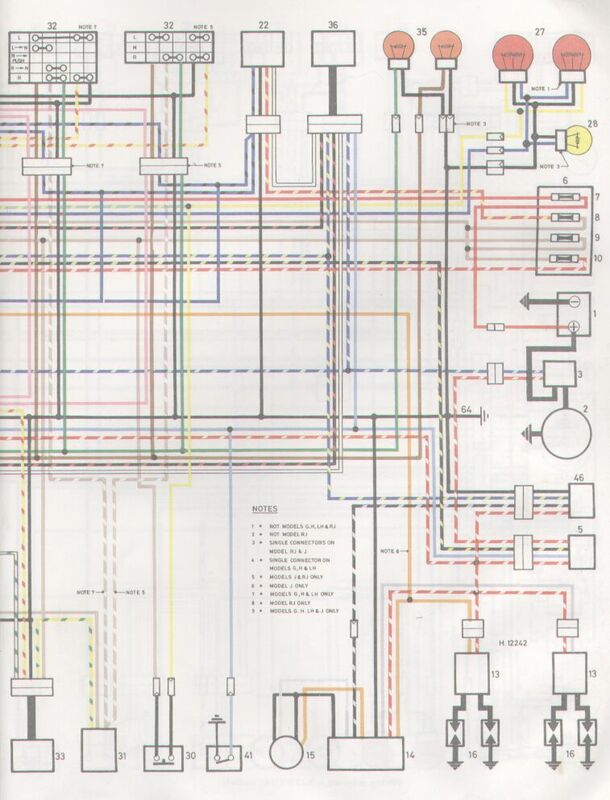 * factory wire diagrams show a main harness Sky Blue attaching directly to the switch ---this is not correct. The Sky Blue wire is on the main harness only, and it attaches (via a bullet connector) to a solid Medium Blue wire that attaches to the switch itself. 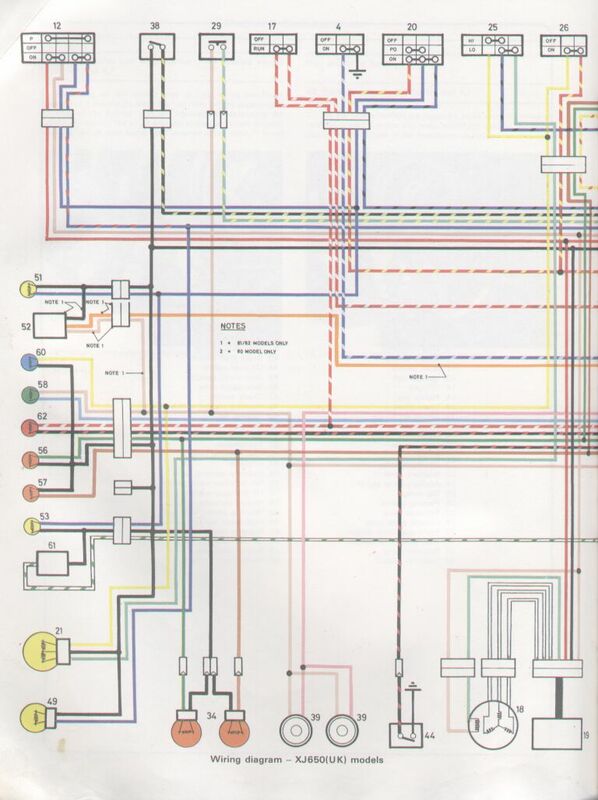 * factory wire diagrams show a main harness Sky Blue attaching directly to the switch ---this is not correct. The Sky Blue wire is on the main harness only, and it attaches (via a bullet connector) to a Dark Blue wire that then runs to the neutral switch itself. This Dark Blue wire is bundled within the pick-up coils harness. - the switch is attached via two flathead screws to the left lower frame tube, somewhere either just forward or behind that actual kickstand mounting bracket. - cast metal housing with two or three lead wires coming off the housing, leading into bullet connectors (550 models) or plastic connector shells (650 thru 1100 models). NOTE: 1980-81 XJ650 Maxim and Midnight Maxim models did not use a kickstand switch, nor did the XJ900RL, N, or FN models. NOTE: XJ650RJ Seca, XJ650 Turbo, 1981-83 XJ750 all models, and XJ900 models sidestand switch units use a switch plunger extension rod, in addition to the short plunger that is built into the switch itself. This extension rod (about 4" long) is not mechanically attached to the switch plunger rod, and is simply held in place via "tension" between the switch plunger rod and the sidestand actuating cam. * Blue wire with a yellow tracer stripe, terminating in a male bullet connector. * Solid black wire, terminating in a sheathed female bullet connector. * Blue wire with a yellow tracer stripe, terminating in a 2-position white plastic connector shell. * Solid black wire, terminating in a 2-position white plastic connector shell. * Blue wire with a yellow tracer stripe, terminating in a 3-position white plastic connector shell. * Green wire with a blue tracer stripe, terminating in a 3-position white plastic connector shell. * Solid black wire, terminating in a 3-position white plastic connector shell. 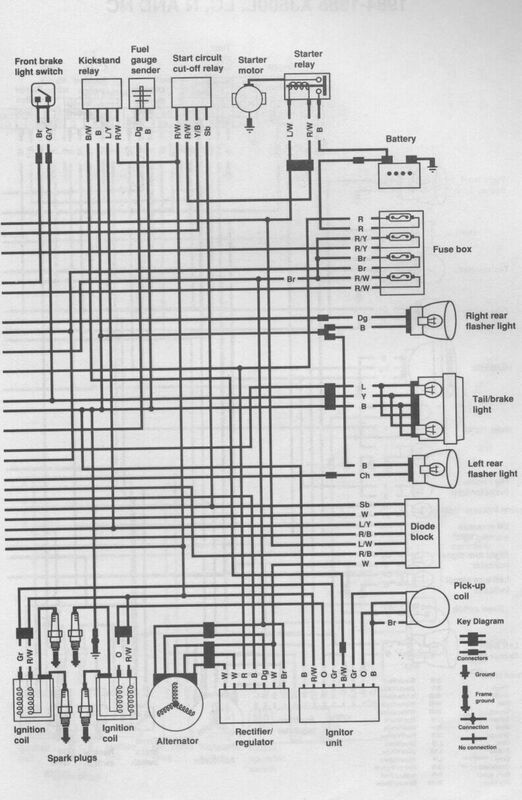 NOTE: some factory wiring diagrams incorrectly show only two wires leading to the sidestand switch, when in fact there is three wires. 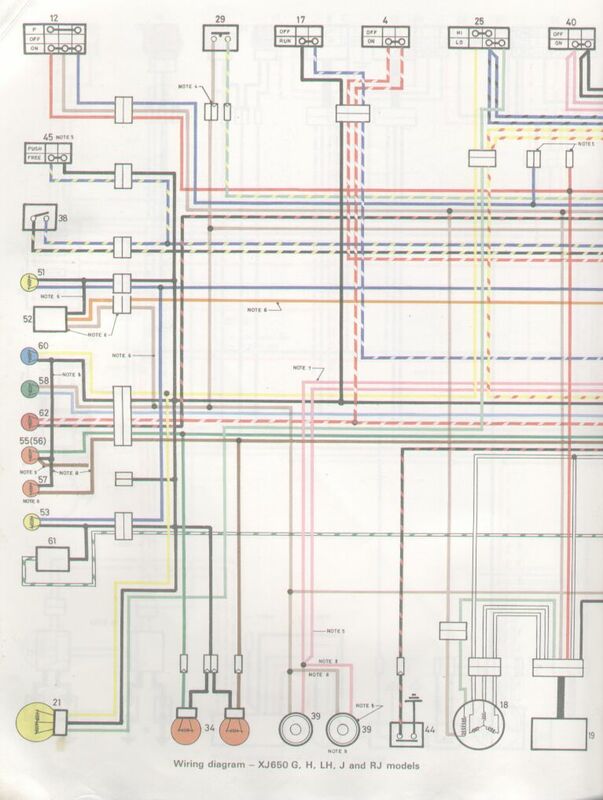 Other diagrams incorrectly show three wires leading to the switch, when in reality there is only two wires at the connector, even though it is a 3-place connector shell. - on all XJ550 models: left side, onto a welded bracket just behind the rear frame cross tube. - on all 1982-84 XJ650 Maxim models: onto a welded bracket outbound of the left outer frame tube, just behind the left coil. - on all XJ650RJ Seca models: under the front of the tank, behind the turn signal flasher relay. - on all XJ650 Turbo models: on a tab bracket welded to the right frame down tube, below the airbox. - on all XJ700 and XJ750-X models: under the left frame side cover, on the plastic regulator-rectifier mounting plate. - on all 1981-83 XJ750 Seca models: onto a welded bracket outbound of the left outer frame tube, just behind the left coil. - on all 1982-84 XJ750 Maxim/Midnight Maxim models: under the left frame side cover, on the plastic regulator-rectifier mounting plate. - on all XJ1100 models: under the fuel tank, behind the left side ignition coil. - small metal (original) or plastic (replacement) "cube" relay, inked 4U8-00, 4U8-01, or 4U8-02 on the top face. - has a blue paint mark or blue locking tab shroud on the bottom of it. - normally closed; does not have an internal diode. - on all XJ550 models: in front of the coil rear mounting bracket. - on all XJ650 Maxim/Midnight Maxim/RJ Seca models: under the gas tank, in-between the frame tubes, on a welded bracket just behind the flasher self-canceller relay. - on all XJ650 Turbo models: on the right side of front fairing main support bracket. - on all 1981-83 XJ750 Seca models: under the gas tank, in-between the frame tubes, on a welded bracket just behind the flasher self-canceller relay. - on all 1981-84 XJ750 Maxim and Midnight Maxim models: under the gas tank, in-between the frame tubes, on a welded bracket just behind the flasher self-canceller relay. - on all XJ1100 models: under the fuel tank, behind the right side ignition coil. - small metal (original) or plastic (replacement) "cube" relay, inked 4H7-00, 4H7-01, or 12R-01 on the top face. - has no colored paint mark on the bottom terminal connector block. - sometimes labeled or described in manuals and diagrams as a "clutch switch unit", a "neutral safety relay", or an "ignition cut-off" relay. - on all models except XJ700 or XJ750-X, or XJ1100 models: housed within a round rubber grommet with a thick, rectangular rubber "foot", the foot being attached to plastic pegs on the side of the battery box. - on all XJ700 or XJ750-X models: housed within a round rubber grommet with a thick, rectangular rubber "foot", the foot being attached to plastic pegs on the side of the battery box. - on all XJ1100 models: behind the right side frame cover, to the rear of the fusebox, housed within a round rubber grommet with a thick, rectangular rubber "foot", the foot being attached to plastic pegs. - small round metal "can" with a larger brown plastic "base". Two threaded metal studs extend from the back of the base, and a two-wire pigtail wiring harness (with a 2-place white plastic connector shell) extend from the base unit. The top face of the metal "can" may or may not have a plastic or metallic decal affixed to it. - same as above, except there may be either one or two wires extending off the base unit, and the wire (or wires) will be terminated with a male bullet style connector, rather than a plastic 2-space connector shell. - on all XJ650 Turbo models: on the left side of front fairing main support bracket. - small metal (original) or plastic (replacement) "cube" relay, inked 5A8-00 on the top face. - has a red paint mark on the bottom of it. This switch is sometimes referred to as a "Ballast Switch" in the service manual. It is activated whenever the tilt angle of the bike is more than about 60-degrees from vertical (so don't lean it too far over in the corners!). If the allowable tilt angle is exceeded....like when you dump the bike....this switch cuts power to the ignition system and, on the XJ650 Turbo model, to the fuel pump. - on all XJ650 Turbo models: on the main fairing mounting bracket. - on all XJ1100 models: under the gas tank, in-between the frame tubes. - small, rectangular switch with two short wires coming off of it and going into a white plastic 2-position connector shell. - on all XJ650 Turbo models: under the gas tank, in-between the frame tubes, on a welded bracket. - on XJ1100 models, behind the battery, on the left side of bike. - small round metal "can" relay with two terminals. Note: the black plastic connector shell that is used with this relay is a unique "L" shaped connector, the only one of its kind on the entire bike. - on all XJ550, all XJ650, 1983 XJ750 Maxim and Midnight Maxim, and all XJ750 Seca models: inside the headlight housing. - on all 1982 XJ750 Maxim and all XJ1100 models: uses a single diode, sheathed inside a clear sleeve, located just outside the main wiring harness bundle, in the area just behind the fuel tank. - on all models except 1982 XJ750 Maxim and all XJ1100 models: a small, flat, thin rectangular shaped, housed within a soft rubber "sleeve" that is approximately 1" wide x 2" long x 1/8" thick, and has 3, 5, 6 or 7 wires coming out of one end and going into a black or white plastic connector shell. - on all 1982 XJ750 Maxim and all XJ1100 models: a single diode sheathed within a clear plastic protector sleeve. The diode has bare wires on each end, terminated with bullet connectors. NOTE: for some odd reason, the wire colors on the main harness side of the connector shell may not always match the wire colors on the diode black side of the connector shell, where the diode black "pigtail" wires are joined to the main wiring harness wires. 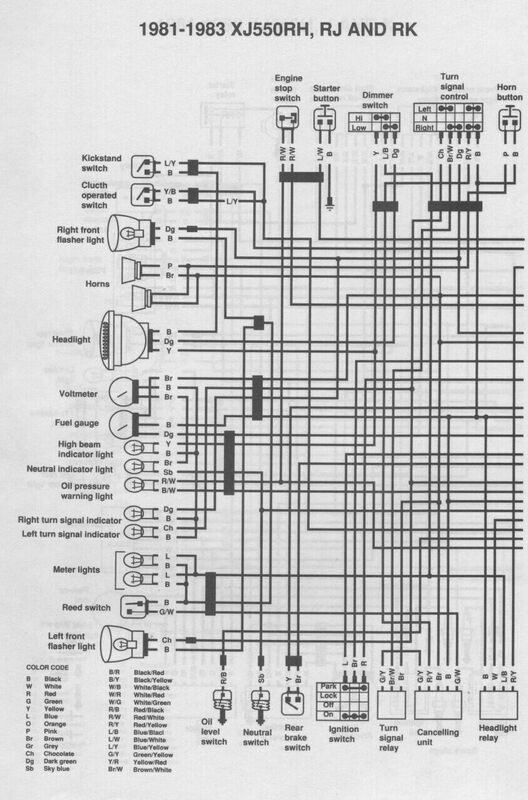 This is most probably due to the diode block being a somewhat "universal" part, used across many different model lines, and functional interchange was deemed more important, by the electrical engineers at Yamaha, than was the wire-lead color compatibility! 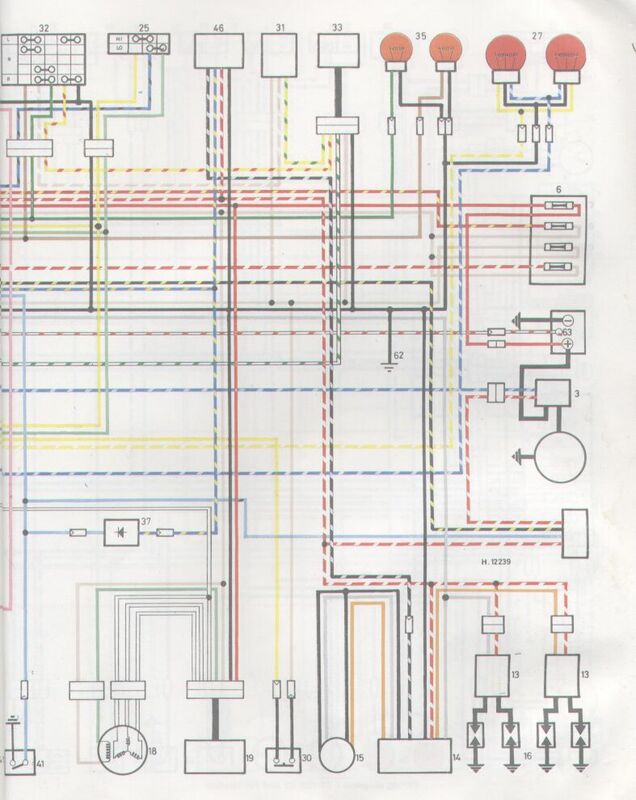 - on all XJ550 models: black with a red tracer stripe, another black with a red tracer stripe, blue with a white tracer stripe, blue with a yellow tracer stripe, solid sky blue, solid white, and another solid white wire, all terminating into a 9-space female connector shell. - on all 1980-81 XJ650 Maxim and Midnight Maxim models: black with a red tracer stripe, another black with a red tracer stripe, blue with a white tracer stripe, solid white, another solid white, all terminating into a 6-space female connector shell. - on all 1982-84 XJ650 Maxim models: black with a red tracer stripe, another black with a red tracer stripe, blue with a white tracer stripe, blue with a yellow tracer stripe, solid sky blue, solid white, and another solid white wire, all terminating into a 9-space female connector shell. - on all 1982 XJ650RJ Seca models: same as 1982-84 XJ650 Maxim models. - on all XJ650 Turbo models: white with a blue tracer stripe, blue with a white tracer stripe, blue with a yellow tracer stripe, solid white, another solid white, and a solid sky blue wires, all terminating into a 6-space female connector shell. - on all 1982 XJ750 Maxim models: a single diode is sheathed within a clear plastic protector sleeve. The diode has bare wires on each end, terminated with bullet connectors, that attach to a solid sky blue wire on one end, and into a blue wire with a yellow tracer stripe on the other end. - on all 1983 XJ750 Maxim and Midnight Maxim models: black with a red tracer stripe, blue with a white tracer stripe, white with a green tracer stripe, solid green, and a solid white wire, all terminating into a into a 6-space female connector shell. - on all 1981-83 XJ750 Seca models: white with a blue tracer stripe, blue with a yellow tracer stripe, solid sky blue, and a solid white wire, all terminating into a into a 6-space female connector shell. - on all XJ900RK and F models: black with a red tracer stripe, blue with a white tracer stripe, white with a green tracer stripe, solid green, and a solid white wire, all terminating into a into a 6-space female connector shell. - on all XJ1100 models: a single diode is sheathed within a clear plastic protector sleeve. The diode has bare wires on each end, terminated with bullet connectors, that attach to a solid sky blue wire on one end, and into a blue wire with a yellow tracer stripe on the other end. - on all XJ700 water-cooled models and XJ750-X models, both of these sensors are located on the thermostat housing. Flasher: on a tabbed bracket at the rear of the ignition coils rear mounting bracket. Flasher canceller: behind ignition coils. Starter motor solenoid/relay: behind the right side cover, behind the access panel, below the regulator. Starter/Ignition cut-off relay (no color): front of coil rear mounting bracket. Sidestand (kickstand) relay (blue): left side, behind rear frame cross tube. Headlight relay (yellow): behind ignition coils, behind flasher canceller. 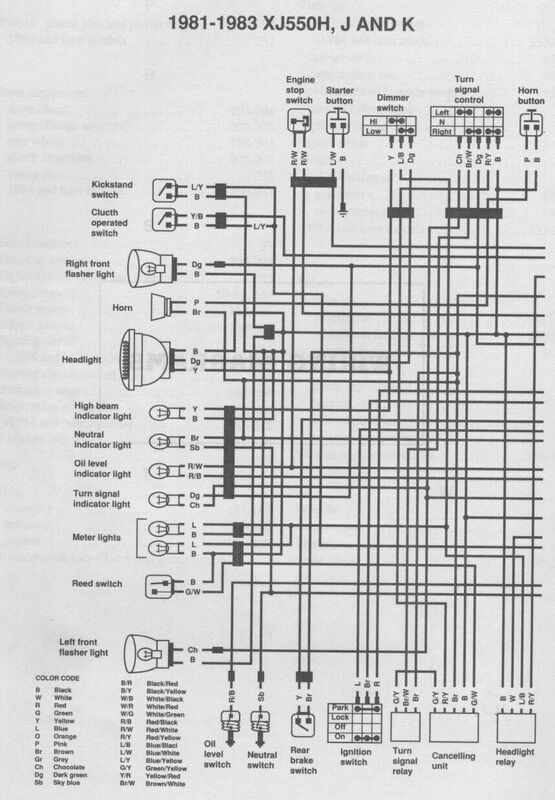 Diode block: inside the headlight housing. Neutral switch: located inside the engine shifter case side cover. Flasher: near the steering headpipe, on right side frame rail, under the right side ignition coil. Starter motor solenoid/relay: on right hand side, attached to and behind the battery box. Starter/Ignition cut-off relay (no color): behind the turn signal self-canceller. (note: the drawing and the description in the service manual is wrong). 1980-81 Sidestand (kickstand) relay (blue): did not use. 1982-84 Sidestand (kickstand) relay (blue): frame bracket outbound of LH frame tube, just behind the left ignition coil. Headlight relay (yellow): behind the left frame side cover, on the plastic regulator-rectifier mounting plate. (note: the drawing and the description in the service manual is wrong). Neutral switch: in a hole in the bottom of the crankcase, just "outside" of the oil pan, on the bottom of the engine, up inside a recessed "well". 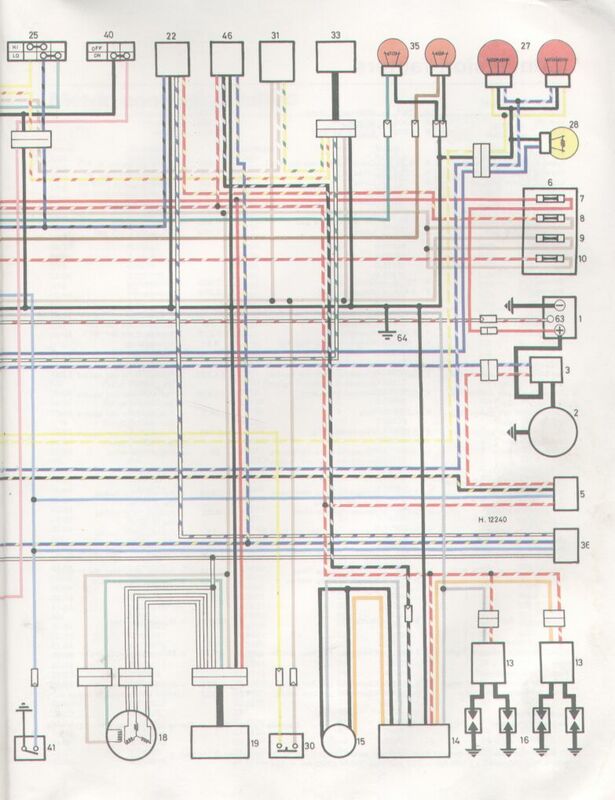 NOTE: according to the factory XJ650RJ Seca service manual supplement, both the headlight relay and the sidestand relay are under the tank---this is wrong! It also shows that the ignition cut-off relay is below the TCI?---this is also wrong! Flasher canceller: under the rear of gas tank. Starter/Ignition cut-off relay (no color): on 650RJ and 650 Euro models, located behind self-canceller, under rear of tank (note: the drawing and the description in the service manual is wrong). Sidestand (kickstand) relay (blue): behind the flasher relay, under the front of the tank. Flasher: onto a welded bracket on the right side of the main headlight support fairing. Flasher canceller: below TCI unit on right side of bike, behind sidestand relay, below the airbox. Starter motor solenoid/relay: on left hand side, attached to and behind the battery box. Starter/Ignition cut-off relay (no color): located on right side of headlight/fairing main support bracket. Sidestand (kickstand) relay (blue): mounted onto a tab bracket welded to the right frame down tube, below the airbox. Headlight relay (yellow): not used. Fuel pump relay (red): located on the left side of headlight/fairing main support bracket. Emergency stop switch: located on the left side of headlight/fairing main support bracket. Emergency stop switch relay (blue): under gas tank. Boost pressure sensor: centrally located below the airbox and the battery box. 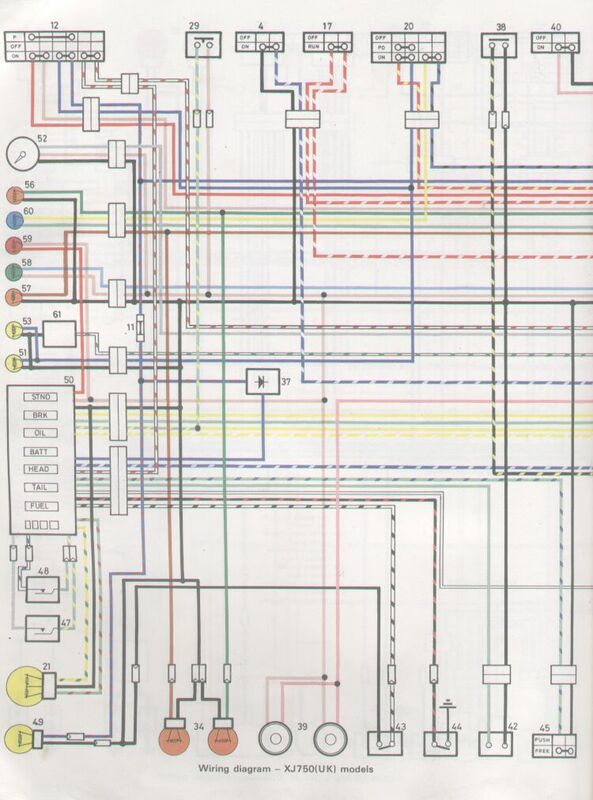 Flasher: combined into the consolidated relay assembly unit. Flasher canceller: combined into the consolidated relay assembly unit. Starter/Ignition cut-off relay: combined into the consolidated relay assembly unit. Consolidated relay assembly: behind the gas tank on the frame tube cross-brace. Starter motor solenoid/relay: attached to and centrally behind the battery box. Sidestand (kickstand) relay (blue): under left side cover, above regulator. Main fuseholder: behind frame crossbar, behind the battery. Diode block: under left side cover, above regulator. Thermo unit: screws into the thermostat housing. Thermoswitch: screws into the thermostat housing. Starter motor solenoid/relay: attached to and behind the battery box. Starter/Ignition cut-off relay (no color): behind self-canceller, under rear of tank. Sidestand (kickstand) relay (blue): behind the left frame side cover, on the plastic regulator-rectifier mounting plate. 1982 XJ750 Maxim safety relay single diode: outside the main wiring harness bundle, in the area just behind the fuel tank. 1983-4 XJ750 Maxim Diode block: inside the headlight housing. Starter motor solenoid/relay: attached to and behind battery box. Starter/Ignition cut-off relay (no color): behind coils, behind self-canceller. Sidestand (kickstand) relay (blue): frame bracket outbound of LH frame tube, just behind the left side ignition coil. Headlight relay (yellow): behind the left frame side cover, on the plastic regulator-rectifier mounting plate. Flasher: in the "electrical tray" under seat. Flasher canceller: in the "electrical tray" under seat. Starter motor solenoid/relay: attached to rear of battery box. Starter/Ignition cut-off relay (no color): in the "electrical tray" under seat. Sidestand (kickstand) relay (blue): in the "electrical tray" under seat. Diode block: in the "electrical tray" under seat. Flasher: on a tab bracket welded behind the right side frame cover, near the fusebox. Flasher canceller: on a "skinny" tab bracket welded in-between the upper frame rails, to the rear of the ignition coils. Starter motor solenoid/relay: behind the right side frame cover, to the rear of the fusebox, housed within a round rubber grommet with a thick, rectangular rubber "foot", the foot being attached to plastic pegs. Starter/Ignition cut-off relay (no color): under the fuel tank, behind the right side ignition coil. Sidestand (kickstand) relay (blue): under the fuel tank, behind the left side ignition coil. Hazard flasher relay (metal "can"): behind the battery, on the left side of bike. Safety relay diode: outside the main wiring harness bundle, in the area just behind the fuel tank. Emergency stop switch: under the fuel tank, behind the ignition coils. Reserve lighting unit: under the seat. Before you start replacing parts in your ignition system, use the handy references below to evaluate the main ignition system components: the pick-up coils, the TCI box, the ignition coils, the spark plug caps, and the spark plugs. The following lists specify the resistance values of the spark plugs, the spark plug caps, the ignition pick-up coils (which are located behind the left side round crankshaft end cover), and the ignition coils. The resistance of the pick-up coils can be checked at their connector to the TCI box by measuring the resistance between the grey and the black wire (this checks the condition of the first pick-up coil) and then between the orange and the black wire (this is the resistance of the other pick-up coil). The TCI "black box" units, unfortunately, are not designed to be "tested" in a simple manner. A troubleshooting guide for this component is listed further below. NOTE: "K" is abbreviation for a thousand units, so "5K" ohms = 5,000 ohms of resistance, etc. Yamaha (thankfully!) used a TCI (which stands for Transistor Controlled Ignition) system on all XJ-series bikes to control the coils, timing, spark advance, etc. A TCI unit is an "early" version of the now-common electronic control systems that are used on virtually all modern vehicles of almost every type, and even these early versions are completely maintenance-free and very rarely cause problems...........which is a good thing, because original TCI boxes are no longer available new. When engine performance problems develops, many people immediately suspect that the cause may be within the "black box" workings of their TCI unit, which is unlikely. The factory service manual gives "instructions" for diagnosing TCI problems, and it basically says "test every other possible cause for your problem and if no other cause for the problem exists, only then should you "suspect" TCI failure, but before you buy a replacement, first try to find a known, working TCI unit from a similar bike and plug it in on the problem bike, and see if the problem goes away............"
1) bad solder joints on some of the internal components (known as "cold solder joints") result in the component pieces coming loose from the circuit board, and thus they can no longer perform their function reliably (or at all). 2) component failure......a blow-up capacitor, a fried transistor, a burned circuit trace, etc. This situation can develop if you have a short-circuit in your electrical system, or hook up your battery or jumper cables incorrectly, etc. TCI units do not like "big blue sparks" in the electrical system (except at the spark plugs, of course!). 3) dirty external terminal connections. Bad solder joints can be repaired by someone who is skilled at that sort of diagnosis and repair, and even individual circuit components can be replaced, but it's tough to find someone in the modern world of "pitch-and-plug" skill-sets who actually has the skill and patience to do this type of work. Yamaha gave absolutely "zero" electrical specifications for checking the condition of the TCI units, besides the afore-mentioned "check everything else first" type of diagnosis. All of the XJ-series TCI units are of the "4RO" style as described in the above article. Typically, most charging system problems are confined to the battery itself, or the alternator brushes. The other components.....the alternator rotor, the alternator stator, and the regulator-rectifier unit......are hardy little beasts, and unless damaged by voltage surges, short circuits, or other assaults, are usually not the cause of charging system problems. The following guide to understanding your charging system was contributed by Dwayne Verhey, extreme XJ-Wizard. The first type is the permanent-magnet rotor system (used on Virago, V-max, and FJR models, among others). In these systems, the fixed-strength magnets in the spinning rotor generate a constant-strength magnetic field, and thus excite the stator coil constantly; thus the alternator puts out 100% current at all times and the voltage regulator merely serves to shunt any excess generated current to ground. The advantage of the permanent-magnet system is a reduced amount of system complexity, but at the cost of increased heat and power losses (since the alternator system is generating power, and thus using up engine horsepower, constantly). The XJ-series of bikes follows the more common automotive model, which employs variable-strength electro-magnets in the rotor. In these systems, the variable-strength magnets in the spinning rotor, when energized, are used to form the magnetic field which excite the stator. The voltage regulator controls the voltage output by varying the input voltage applied to the rotor's electro-magnets, and thus varies the strength of the magnetic field. If the system voltage drops, the voltage regulator increases the voltage fed into the rotor electro-magnets, thus increasing the strength of the magnetic field that the magnets produce, and therefore increasing the excitation (output) from the stator....and thus the alternator output voltage increases. In both systems, the stator windings are 3-phase. Each stator wiring bundle (there are 3 of them, and each bundle is called a "leg") kicks out similar voltage, but 120-degrees out of phase with the adjacent leg(s). The resulting AC currents are then rectified (changed) to DC current via a 3-phase bridge rectifier, made up of 6 diodes, such that current in any leg flowing in either direction is directed back into the system as 12-volts DC (actually, around 13.5 to 14.5 volts DC, when everything is working properly). - first check the resistance on the wires to the rotor. If resistances are out of spec, then check for dirty rotor commutator rings, corroded connections, etc.----all of these problems will reduce the available rotor field voltage. - next, check the condition of the connectors from the stator to the rectifier (the 3 white wires). There's usually 2 connectors -- one from the alternator, often hidden behind the battery box, and the other near the regulator. Corrosion in these spots will reduce the stator's outputted current (bad corrosion will often melt the connector, as the outputted current turns into heat rather than being delivered to the battery). - next, with the engine running, back-probe each of those 3 white wires at their connector to ensure voltage is being generated on each leg. NOTE: the voltage on those 3 white wires is AC, not DC, so be sure to set your voltmeter properly. AND, YOUR CHECK WILL BE BETWEEN WIRE PAIRS (wire #1 to #2, wire #2 to #3, and wire #1 to #3….and it doesn’t matter which one you consider wire #1 or #2 or #3 to be, as long as each wire’s output is checked)……AND NOT TO THE FRAME OR (GOD HELP YOU) TO THE BATTERY NEGATIVE. You should see some voltage (the actual amount is meaningful, nor specified) on each test, and the voltages should be about the same on each leg. - finally, using your multi-meter and following the directions in the service manual, check the function of each of the 6 diodes in the rectifier to make sure the power is being properly rectified from AC to DC. Is it your battery, or your charging system, or something in-between? 1) with the engine and all electrical accessories off, the battery should read a minimum of 12.8 volts DC. If not, the battery is either not fully charged, or it is bad (it is incapable of holding a full charge). Charge the battery fully and check again; if the reading is less than 12.8 volts, the battery is bad and should be replaced. NOTE: most manuals describe checking the specific gravity of each battery cell electrolyte (fluid) as the preferred method of checking the condition of the battery. This reading should be between 1.2650 - 1.280 per cell. If a fully charged battery cannot reach these levels in all cells, then that cell is bad and the battery should be replaced. 2) If the first test above passes, leave the multimeter hooked up to the battery terminals, and press the starter button. While the starter is engaged (but before the bike starts), the battery voltage should be 9.5 volts or greater. If not, then this signals either a bad battery, very dirty or weak electrical connections, or it could be a incredibly problematic starter motor (not likely; it's probably the battery!). * "There were a few times when I cranked it, that it ALMOST started. It would start to fire immediately as I let off the start button. But it just wouldn't catch. Test the battery voltage WHILE THE STARTER IS ENGAGED (a voltmeter across the + and - terminals of the battery is all that's needed). It should remain above 9.5 volts while the starter motor is engaged but without the engine running. If it drops below that level while the starter is active, then that's the "problem", and the cause of that problem must be determined and remedied (usually a sign of a bad battery, or it could be a incredibly problematic starter motor). * 14.2 - 14.8 Volts at about 2,000 rpms for all non-X models, and the same voltage for "X" models, but at about 3,000 rpms. Again, you would measure these voltages at the battery terminals with your voltmeter. NOTE: If your alternator is outputting more than 14.8 volts to the battery, your regulator-rectifier unit is bad and should be replaced. Over-charging a battery will quickly ruin it, and may cause severe damage or failure of other electrical components, such as the TCI or the computer monitor system (on bikes so equipped). your battery to conduct this test. a) Adjust voltmeter to DC volts (20 volt range). b) Place voltmeter leads to the battery terminals (positive to positive and negative to negative). c) Read voltage and refer to the chart below. b) Place voltmeter leads to the battery terminals (positive to positive and negative to negative) . c) Watch the voltmeter as you start your motorcycle, but before the engine is running. d) If the voltage drops below 9.5 volts, the battery has very low capacity and should be replaced. d) Bring engine up to approximately 2,500 rpm's. If your charging voltages are too low, suspect the alternator brushes first, then perform the alternator stator and rotor checks as described in the Alternator Section. If your charging voltages are too high, suspect your Regulator - Rectifier unit first, and perhaps dirty or corroded electrical terminals. The procedure for checking these is too detailed to describe here, and you should consult your service manual for additional details. * the positive battery post connection to the positive battery cable. * the positive battery cable connection to the starter relay (or "solenoid"). * the main harness terminal connector from the starter relay. 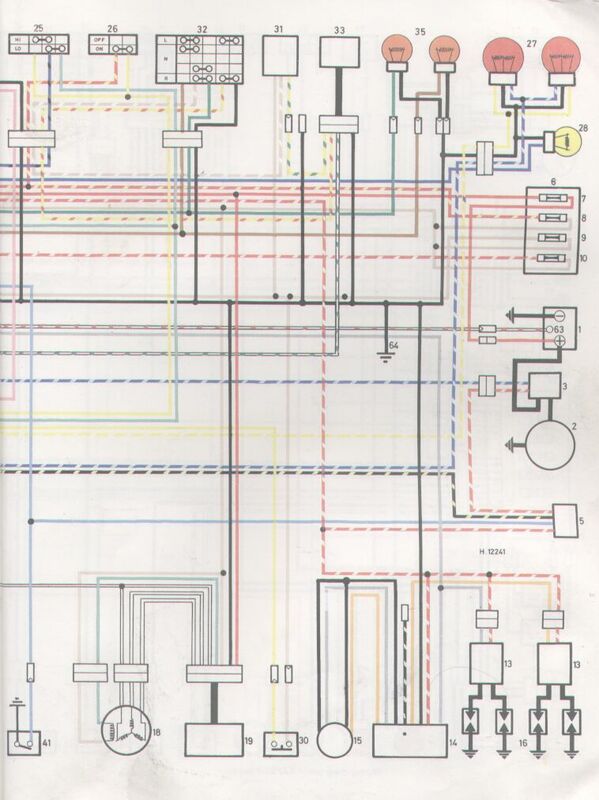 * the main lead from the starter relay to the starter motor (both ends). * the "main fuse" contacts inside the fusebox. * the battery ground cable contacts at both the engine case and at the negative battery post (poor ground are just as bad as poor positive feeds; after all, it takes two to tango, or to complete a circuit, and electricity doesn't care where the restriction occurs). 0.50 ohms +/- 10% for all XJ550 models. 0.46 ohms +/- 10% for all XJ650, all XJ700, all XJ750, and XJ900RK models. 0.37 ohms +/- 10% for all XJ1100 models. 0.40 ohms +/- 10% for all XS1100 models. Note that the resistance specifications for the stators are extremely small; they should barely have any resistance at all (compared to most other electrical devices). Measure the resistance across the two lead wires (usually brown and green) at the connector; the specifications should be:. 4.5 ohms +/- 10% for all XJ550 models. 4.0 ohms +/- 10% for all XJ650, all XJ700, all XJ750, XJ900RK, and XJ1100 models. 3.5 ohms +/- 10% for all XS1100 models (field coil). This information is really important, and you should take the time to understand it. 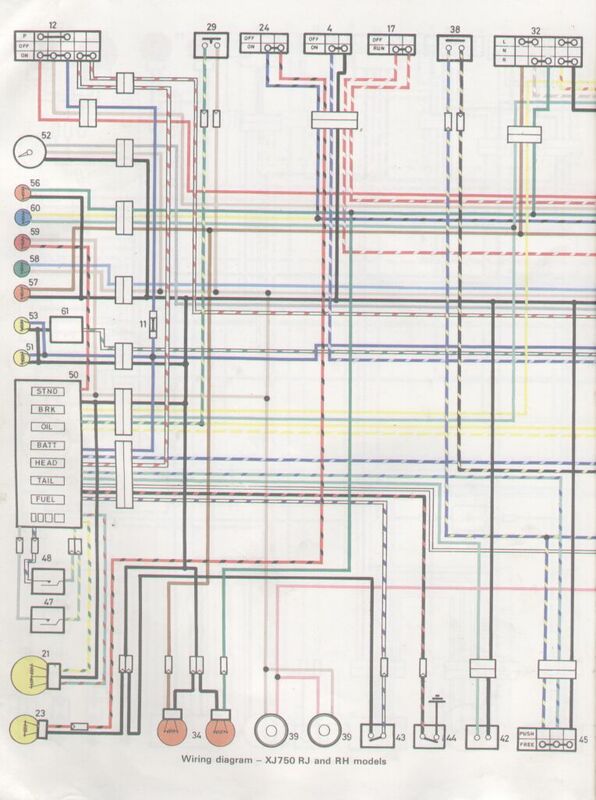 MiCarl's wiring diagrams: note that some of these diagrams are for Euro bikes, which may be a bit different than North American bikes. 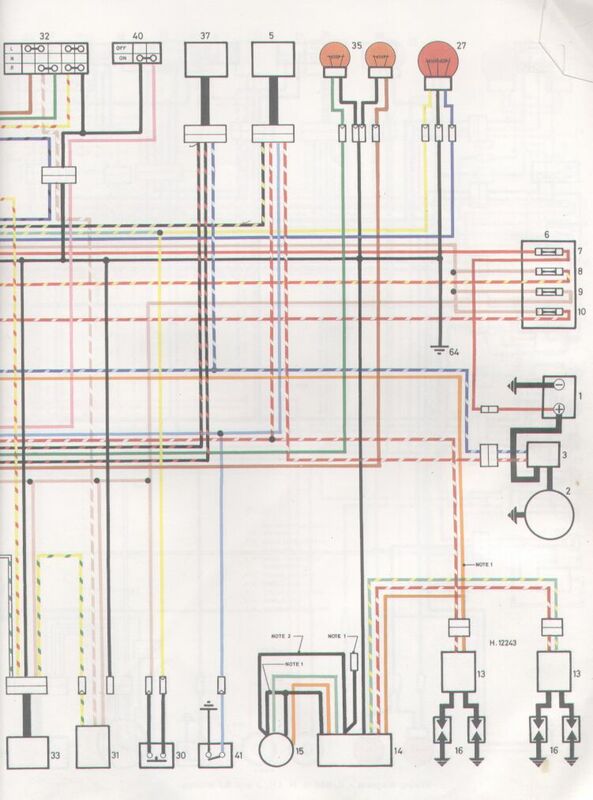 Also beware: factory wire diagrams do have errors in them. NOTE: some of these may be for non-US models.